Recently I accidentally landed upon a view of my blogs stats that I’d never seen before. It showed me every single post or page I’d ever written alongside a statistic for each showing how many times each article had been visited. There were 2 things I was a little shocked by. My first ‘shock’ reaction was really to the full screen version of the above screenshot. While you can’t really see this in the screenshot above, I’ve written a lot of articles in the span of three years. More if you combine those at my sister website vsatrends. Even though I pretty much work at this 24/7…it surprised me to see the results of my labors all so nicely contained in one clean screenshot. If you want to you can read more about my discovery and see the whole, full resolution screenshot, which basically shows all the content I’ve written for my entire vsatips website in 3 years time. The reason I had to publish the full image as a separate post is because the density of the page along with using an image resolution that keeps the text readable makes the file size of it too high to include here. Because it would adversely impact page loading times and people would get bored and wouldn’t ever get to read my article. Why does that number surprise me? When I first wrote this I was so certain that it was something a lot of people would want to know about. But after I published it, it remained decidedly ‘unpopular’ for a very long time. I did vaguely notice that somewhere along the line this began to change…but I really had no idea just how significant the change really was. 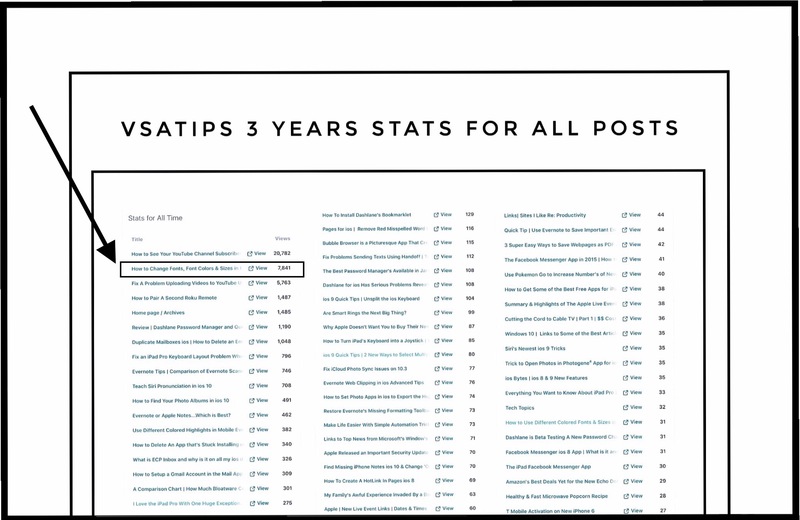 Of course, if you did visit the full-page listing you probably will note that even 8000 views aren’t very many when compared to my most popular post of all time…which is all about finding out who follows your YouTube Channel. That one has over 20,000 views…and gains 50-100 new ones per day lately. Unfortunately, my Evernote statistic didn’t just shock me…it made me feel terribly guilty too. On January 26th, Evernote released a brand new ios app…the app has been completely redesigned! from Right Within Evernote’s ios App!!! 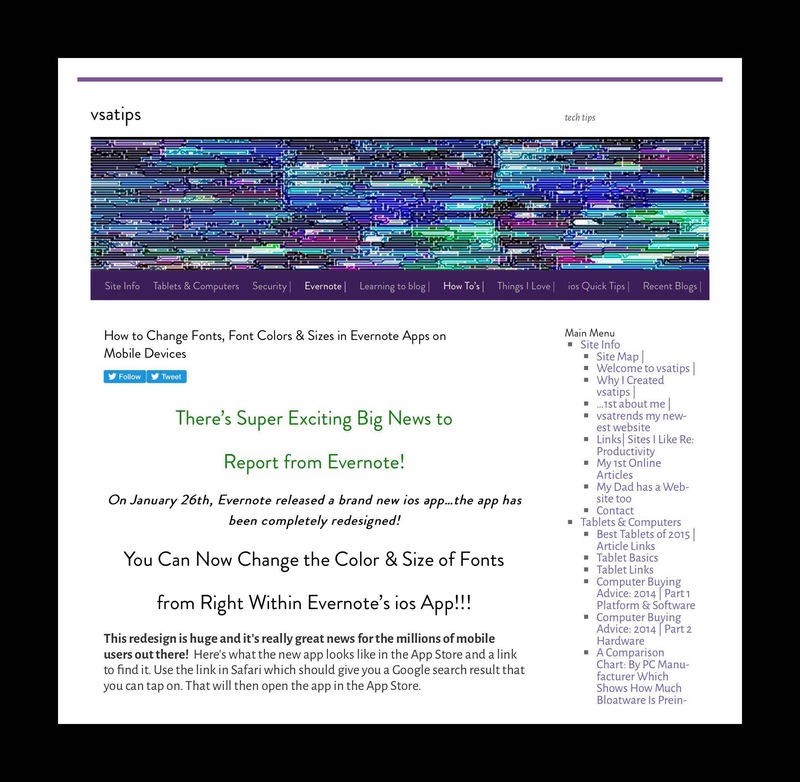 The facts that Evernote 8 came out at the end of January and that it simplifies the process of using various sized fonts as well as colors a lot, combined with my promise to my readers to help instruct them on how to use these new features…and that it’s now July…explains my guilty conscience (I hope.) So please accept my humble apologies and read on to learn how to use these new features. When my day began on January 26, 2017, the day that Evernote’s historic new update was released I found myself at Mayo Clinic in Rochester, MN undergoing my first Executive Physical (which was ironically another post I’d promised to some of the loyal followers of my sister website vsatrends.) While I haven’t yet finished the Executive Physical post,here’s a link to a story my 91-year-old Dad wrote about my childhood experience at Mayo’s when I almost died and they saved my life…which I republished from his blog. Consequently my visit to Mayo’s this time meant that it took a few days before I’d even realized that the new Evernote 8 had finally been released. Prior to Evernote 8’s release it was very difficult to vary font colors and sizes without resorting to some convoluted methods. I came up with the approach I offered in that first post on my own because I need that kind of variation for my own notes. Possibly because I’m severely ADHD and mildly OCD, and using colors and sizes helps me to quickly absorb a notes’ contents and find any information I’m looking for readily. I’m a beta tester for the ios platform of Evernote and I had been using the new Evernote 8 in several different iterations for about 3 months prior to the huge release January 26th. Beta testing for the ios platform at Evernote is serious business. We were sworn to secrecy before we were even allowed to participate in the program. Unlike any other update I’d worked on prior to that, with this update we were continually reminded of our obligation to maintain secrecy…so we all knew that this update was a very big deal! 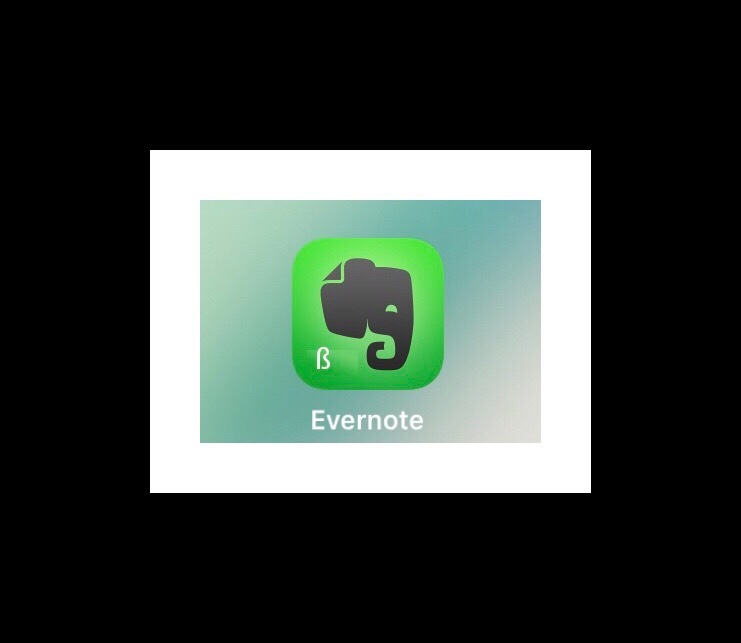 The Evernote Beta Version icon has a ‘B’ on it. Evernote’s ios beta testers offered a ton of unique insights into addressing some of the problems. In many ways Evernote 8 felt to all of us like our work was recognized and rewarded. We all, I think, shared a little pride of ownership in what we now knew was the reason some of our problems had never been adequately addressed. We did enjoy it too…because Evernote 8 is the best thing that’s ever happened to a Evernote since the vast majority of users have been using it. One view provides tools for creating ordered and unordered lists, checkboxes, indenting and indenting and their 3 paragraph formatting alternatives of left, center and right orientation. One view which provides the 12 color, 3 font sizes, a highlighting tool and bold, underlined and strike through text. The strike-through text, while not something I use often, is a relatively unique tool that comes in extremely handy in certain situations. The best way I’ve found to change font size or colors is to first enter the text that you want to format, and then select and format it. As an example, I’ll demonstrate how to do this for the title of this section above. Next, keeping your selection active, tap on the Capitol A with threes small line next to it to open the colors and size view…see the screenshot above. 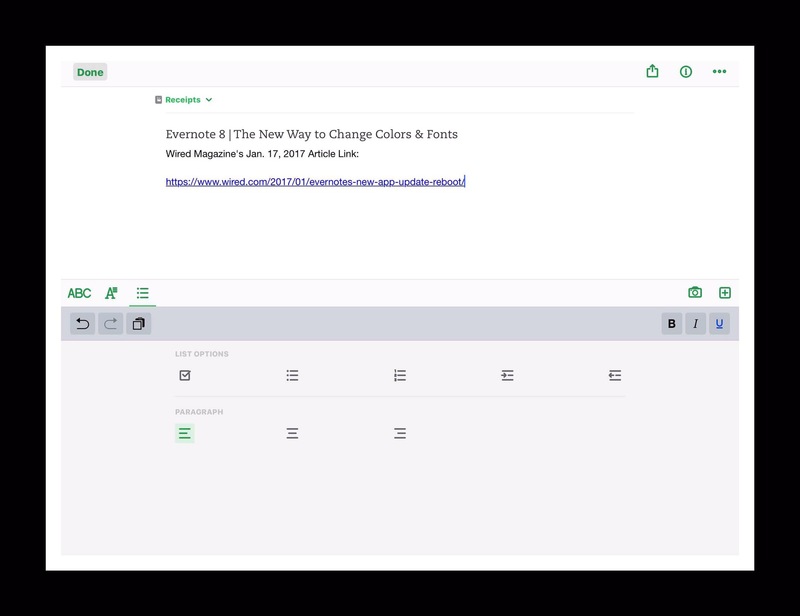 Evernote 8’s New font formatting view. Now just tap on the color and size you’d like to use. On most of my iPads I need to tap my selection more than once in order for it to ‘take.’ You can tell it’s ‘taken’ because your selection will be highlighted like those below. Last just tap on the ABC icon to close formatting view and return to the keyboard and typing. Another way you can alter the colors and sizes is by first selecting your desired alternatives first and then just begin typing. In this example I selected the largest sized font in Evernote’s classic green color, and I added bold to the mix too. There are a few changes that you can make to a font’s appearance without ever opening the new formatting views. These are exactly the same as it’s always been in earlier versions of Evernote. 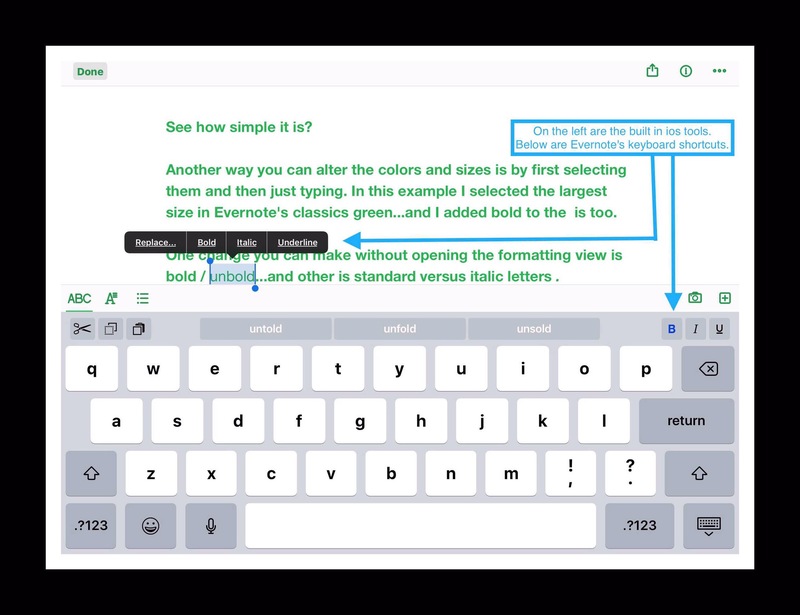 In all cases you can just select the text you want to change and use either the built-in ios method to change styles or use the shortcut that Evernote provides in the upper right-hand corner of the onscreen keyboard. Refer to the screenshot below. 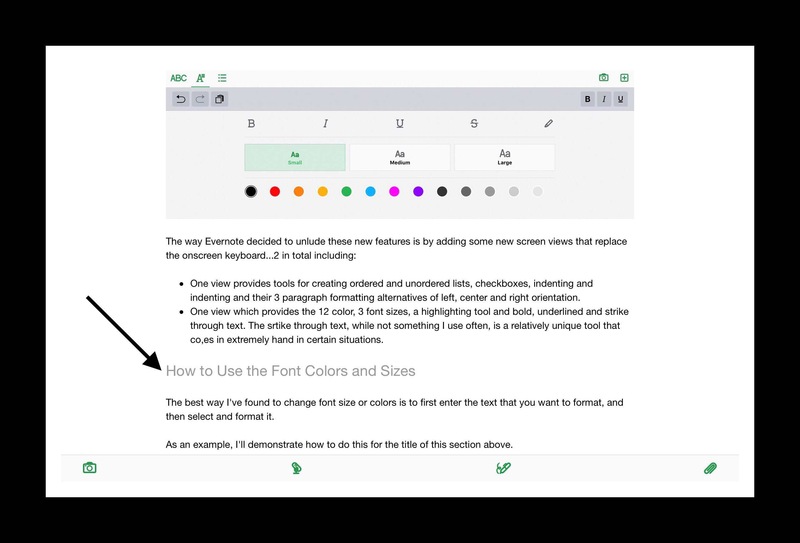 Here’s a list to the 4 guides I’ve written to using different colored fonts, different sizes fonts, different fonts, and different colored highlights for my 2 favorite notes apps…Evernote and Apple Notes. They are listed from most current to oldest. BELOW ARE LINKS TO: My Workaround Method. 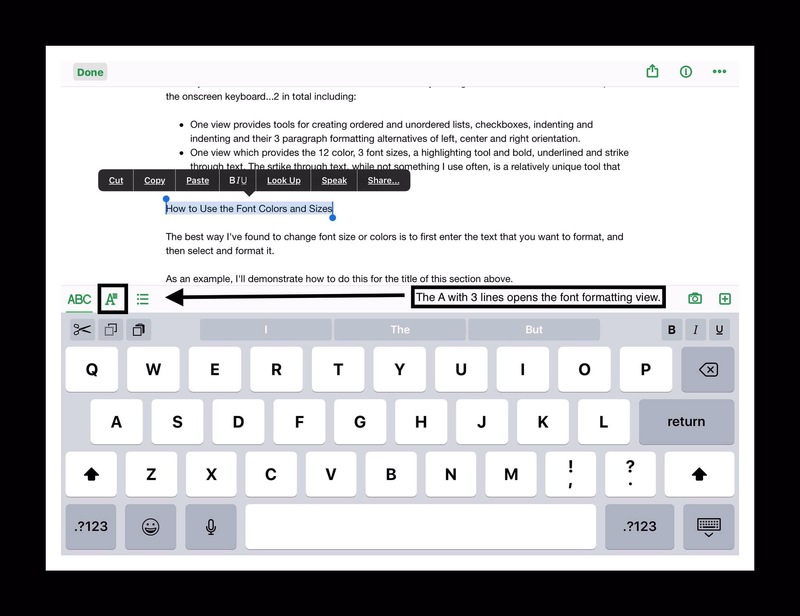 As of January 2017, Evernote 8 now gives users the ability to change font sizes and use about 10 different colors right in the ios app. I need to check but it’s probably in the Android app too. But there is only one highlight color…their standard yellow. So if you want to use different highlighting colors you’ll still need to use my workaround method. Because I’m testing out the beta version of ios 11 there’s a new screen recorder! I wrote a post about it here. But that gave me the ability to make this little video demonstrating how to use my workaround method. 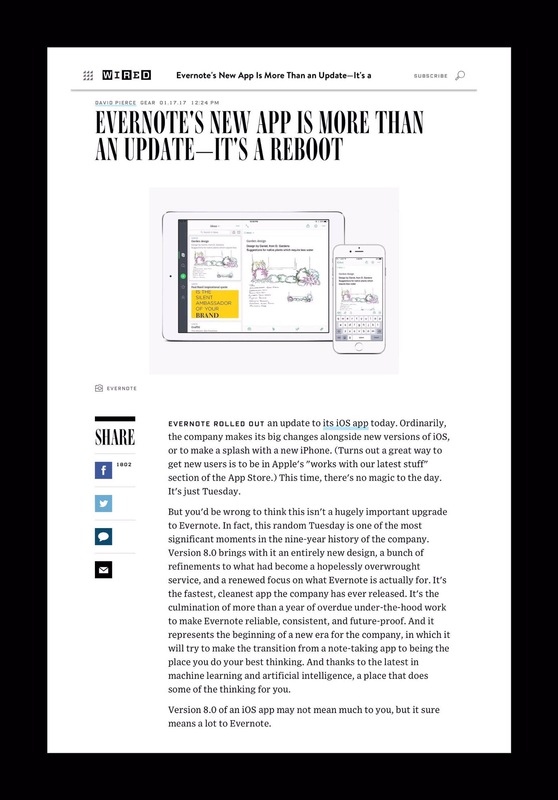 Many top tech publications wrote glowing articles about Evernote’s newly released update. One of my favorites was written by Wired Magazine. It’s made clear by reading some of these that it’s not just the beta testers who fell in love with the new Evernote. Here’s a link to the Wired Magazine’s Jan. 17, 2017 article pictured above. AppleInsider wrote a great overview of Evernote 8. Please leave any comments by scrolling down a little ways past the ad’s below…or go there to read other’s comments too. 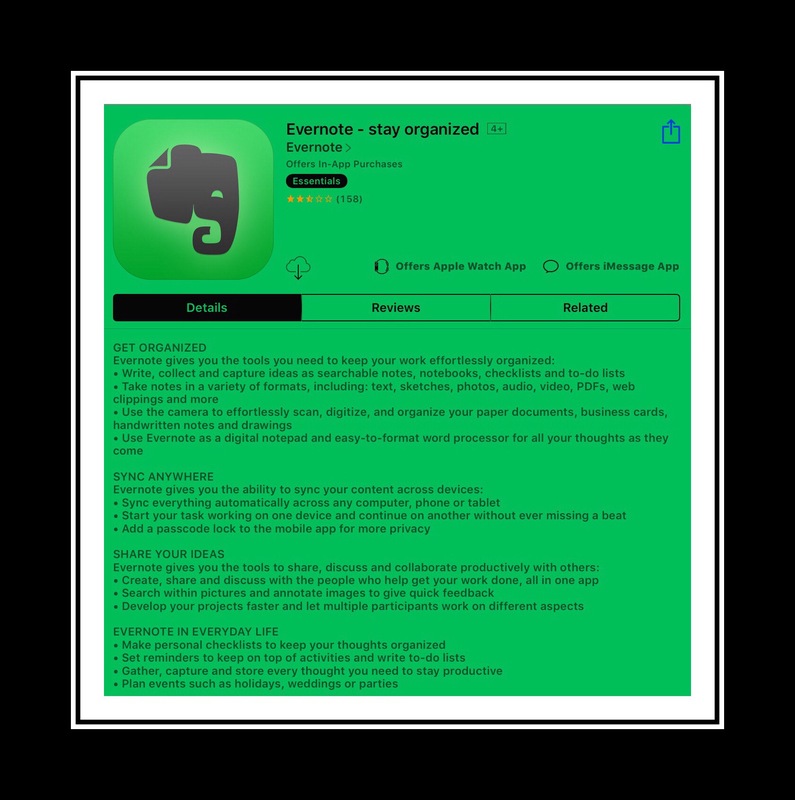 This entry was posted in Evernote, Evernote Hacks, Evernote's versatility, Tech Tips and tagged Apple apps, colored fonts Evernote, different font sizes Evernote, Evernote, ios, ios 10, Titles and Headlines in Evernote mobile. Bookmark the permalink. Нellо, I wouⅼd liқｅ to subscribe fоr this web site to get newest updates, so whеre can і do it pleaѕe help. Hi, Thanks…sorry it’s not clearer. At the very top of each Article is a place on the right that you can subscribe. I could try to do it for you but don’t know if that will work. If I tried it then you would recieve a confirmation email asking you to reply if you do want to subscribe. There may be a place at the bottom too…but frankly I had problems finding them myself so I’m not surprised you didn’t see it!